Metro is currently undertaking the largest transit infrastructure expansion effort in the United States. A rapidly growing system presents new opportunities to catalyze land use investment and shape healthy, sustainable, and integrated neighborhoods along the region’s transit network. Metro is committed to working with municipalities and the development community to encourage and support construction adjacent to transit to help create vibrant transit oriented communities (TOCs). 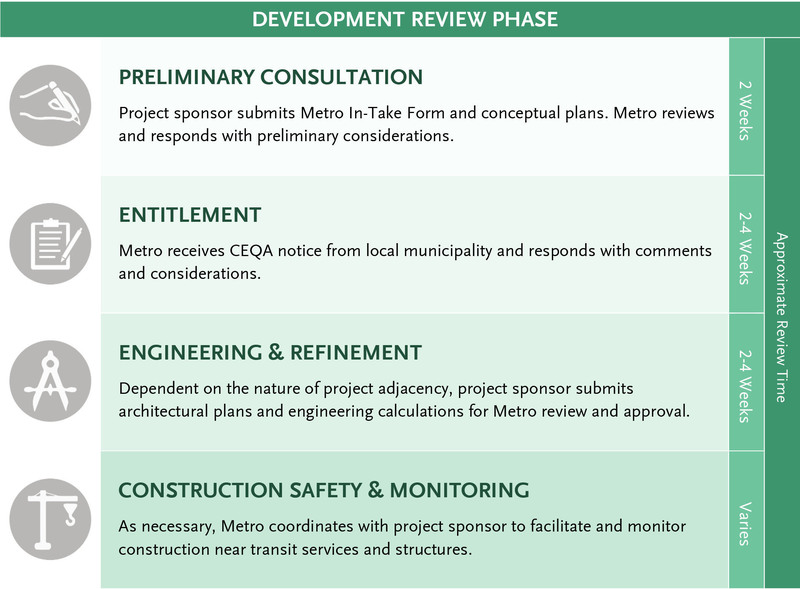 To initiate Metro’s development review process, please complete an In-Take Form and submit to: devreview@metro.net . To help facilitate transit-adjacent building activity, Metro created the Metro Adjacent Development Handbook – a resource for municipalities, developers, architects, and engineers to use in their land use planning, design, and development efforts. This Handbook presents a crucial first step in active collaboration with local stakeholders; finding partnerships that leverage Metro initiatives and support TOCs across Los Angeles County; and ensuring compatibility with transit infrastructure to minimize operational, safety, and maintenance issues. Project sponsors should review the Handbook in advance of initiating the Metro development review process. Metro maintains a technical resource website housing downloadable data sets and web services. Developers and municipalities should utilize available Metro right-of-way GIS data to appropriately plan and coordinate with Metro when proposing projects within 100’ of Metro right-of-way.